« Flashlight or bike light? Upper Alpine Road (dirt) has been repaired. A friend told me the upper section of Alpine Road that had a washout has been repaired, so I checked it out. It’s about a half-mile down from Page Mill Road in the “freeway” section. 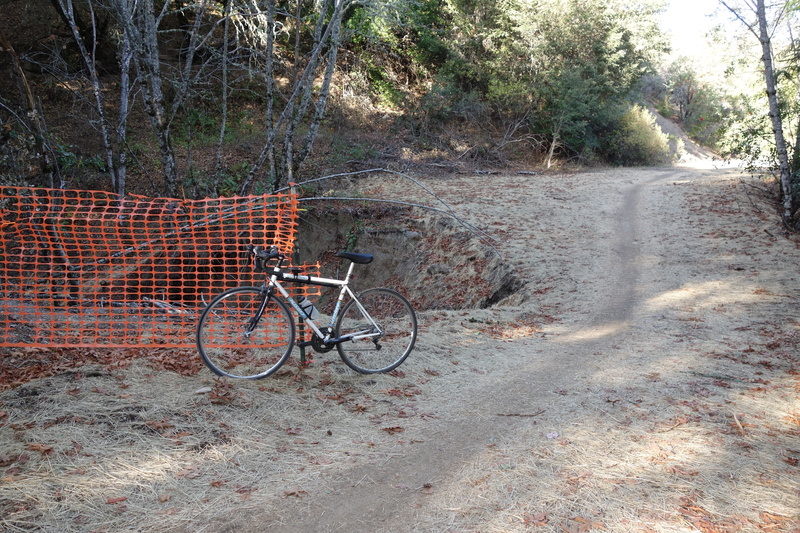 Eons ago there was probably a washout in this same location and San Mateo County repaired it by widening the road. The culvert plugged up again and washed out a year or so ago. In wet years this ravine has a decent flow, but since the Great Drought it hasn’t seen much water. I’m told Midpeninsula Regional Open Space District made the repair, even though the road is still under the jurisdiction of San Mateo County. But don’t hold your breath that the county would do anything to fix Alpine Road. The “road” is in the best shape I’ve seen it, all things considered. It’s a far cry from what it was in the late 1980s when it was graded for the last time and there weren’t any washouts. The bypass trail is still an insult to cyclists. Elite mountain bikers and hikers (not than anyone hikes here) wouldn’t think so though. This entry was posted on December 15, 2013 at 2:30 pm and is filed under News. You can follow any responses to this entry through the RSS 2.0 feed. You can leave a response, or trackback from your own site.